피아니스트 노화영은 계원예술고등학교를 거쳐 한양대학교 음악대학에서 성적장학금을 수혜하며 우등으로 졸업한 후 도미하여 전액장학생으로서 일리노이 음악대학(Western Illinois University)에서 피아노 연주(Piano Performance) 석사학위(M.M)를 취득하였다. 이후 텍사스 테크 음악대학(Texas Tech University)에서 전액장학금 및 AT&T Chancellor’s Fellowship을 수혜하며 피아노 교수법 과정(Graduate Certificate in Piano Pedagogy) 및 피아노 연주(Piano Performance) 박사학위(D.M.A)를 취득하였다. 경기도학생음악콩쿨에서 1위, 국제문화교류회콩쿨 2위, 국제문화예술교육회콩쿨 2위 등 국내 유수의 주요 콩쿨에서 입상하여 두각을 나타내었으며, 이원신인음악회, 수원신인음악회에서 연주하며 피아니스트의 재능을 발견하였다. 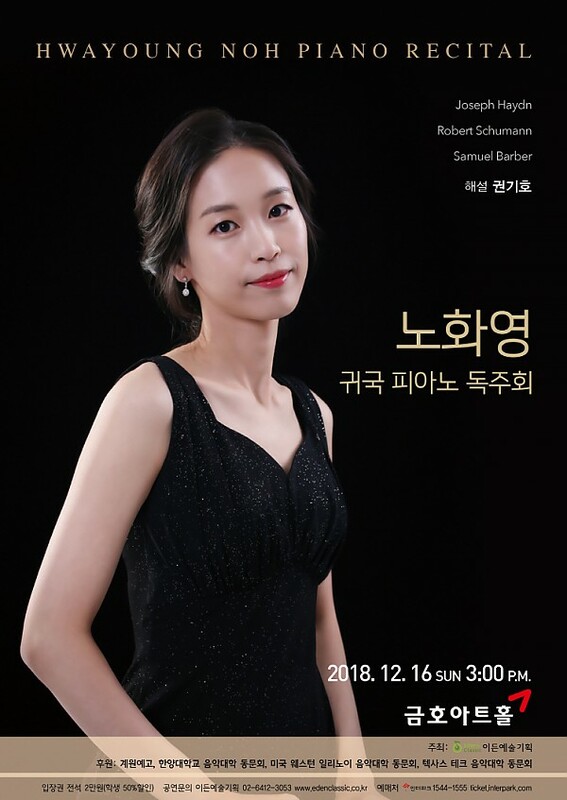 미국 유학중 학업이외에 활발한 활동을 하며 The International Music Competition ‘Salzburg’ Grand Prize Virtuoso 1위, The American Prize Competition, Illinois State Music Teacher Association Competition에서 입상하였으며, 심사위원으로부터 매우 섬세하고 따뜻한 음색을 표현하며 자신감 있고 명확한 연주를 하는 젊은 음악가라는 평을 받았다. 이후 The American Protégé International Concerto Competition 2016 에서 1위에 오른 후 뉴욕 카네기홀에서 데뷔 연주를 성황리에 마치며 호평을 받았다. 그 밖에 Bowdoin International Music Festival에서 Collaborative Fellow로 선발되어 많은 솔리스트들과 연주를 하며 실내악 연주자로도 활동하였으며, South Plain College 초청 연주, Hemmle Recital Hall, Studzinski Recital Hall에서 연주하며 다양한 독주와 실내악 활동을 활발히 하였다. 더불어 Texas Tech University Concerto Competition 우승으로 TTU Symphony Orchestra와 협연하며 전문 연주가로서의 실력을 인정받았으며 Jon Kimura Parker, Janice Wenger, Michael Lewin, Alan Chow 등 저명한 피아니스트들에게 마스터클래스를 받으며 연주에 대한 연구를 하였고, 박사논문 “Style, Culture, and Politics in Piano Waltzes of the Early Twentieth Century: Ravel (1911), Hindemith (1922), and Prokofiev (1940)”를 주제로 다양한 음악적 해석을 연구하며 연주 외에 학업적으로도 끊임없이 연구하고 노력하였다. 김명신, 손은수, 최문선, 김민정, Tammie Walker, Westney William을 사사한 노화영은 한양대학교 남성합창단, Western Illinois University Graduate Assistant 반주조교, Texas Tech University Opera Theatre 리허설 피아니스트를 역임하였고, Texas Tech University Teaching Assistant로 피아노 실기 및 그룹 피아노 클래스 강의를 담당하였다. 현재 강원 피아노듀오협회, 법인 산하 피아니아협회, 피아노교수법 학회, 수원음악협회 회원으로 왕성한 활동을 하고 있으며, 이번 귀국 독주회를 발판으로 다양한 무대를 통해 관객들과 소통하는 연주자로 활동을 이어나갈 예정이다.